Northern Invasion: Is Dallas Slowly Turning Into Chicago? Texans have an appreciation for the finer things in life: peppery brisket with a gorgeous pink smoke ring, fall-off-the-bone ribs that leave your fingers a mess -- but that doesn't mean we're completely closed minded when it comes to the charms of other cuisines. The foodstuffs of one locale in particular have increased their presence considerably in recent months. Yes, DFW is starting to develop a fair amount of Chicago flavor. Who are the major players in this Windy City invasion? Let's investigate. 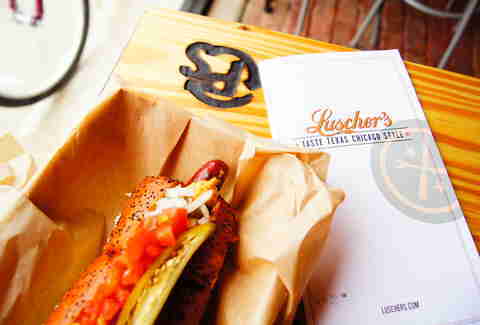 The first installment of Luscher’s Red Hots (courtesy of Brian Luscher -- Chicago native and chef-owner at The Grape) has finally opened its much-anticipated doors, fired up its flat top, and is slinging gourmet, Chicago-style dogs with a slight Texas twist. They sport a poppy seed bun, the perfect blend of pork & beef, tomatoes, white onion, spicy brown mustard, piccalilli, and pickled sport peppers. So yeah, there are a few departures from the standard Chicago dog, but it's a fairly faithful interpretation with a slight Texas accent. For another Chicago variation, try the Depression Dog, which has fewer toppings but sports a mess of French fries piled right onto the dog. While the hot dogs are absolute showstoppers, don’t sleep on the "Eye-Talian" Beef either. A healthy portion of locally grown Wagyu beef that has been simmering in garlic, spices, and of course, it’s own beefy goodness, is shaved into a French roll and then topped with giardiniera (spicy pickled veggies) and a healthy helping of that gravy (or juice, or whatever you want to call it) in which the beef's been swimming. If you really want to go Chicago-style big, get a combo, which adds an Italian sausage to the party. You know that Italian beef you just read about? 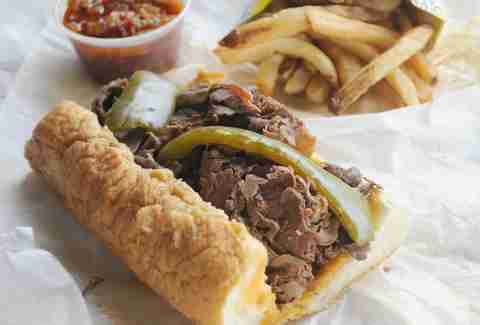 Well, Al’s #1 Italian Beef is one of Chi-Town's heavy-hitters in that department, and it's made its way down to Addison. Al’s was started in 1938 by Al Ferrari and was made out of necessity during the Great Depression; they were stuffing a smaller amount of very thinly shaved beef into thicker loaves of bread. Now that the Great Depression is over, they are much more generous with the meat portions, but they still use the same recipe that Al developed back in his kitchen so many years ago. In fact, the original location of Al’s on Chicago's Taylor St still operates today. You can get your beef (no Wagyu here) topped with cheese if you like (a non-traditional move but not uncommon in Chicago either). You also have a choice of sweet or hot peppers (the hot is that aforementioned giardiniera). You should ask for both. They'll happily load your sandwich up with a little extra gravy, but if you really want to go crazy, get it "dipped" and they'll dunk the whole damn sandwich in the stuff. It's messy, but worth the trouble. Texans seem to have taken to this Italian beef thing -- Al's has been packed pretty much since it opened. It's not just about beef, either. Here too you'll find Chicago-style dogs, burgers, and don't pass on the fresh-cut fries that you can dress up with chili, cheddar, buffalo blue cheese, and other accoutrements if you so choose. Back in the '60s, Gino’s East started when two taxi drivers and their good friend got fed up in Chicago traffic... so, naturally, they decided to start making gigantic deep dish pies. 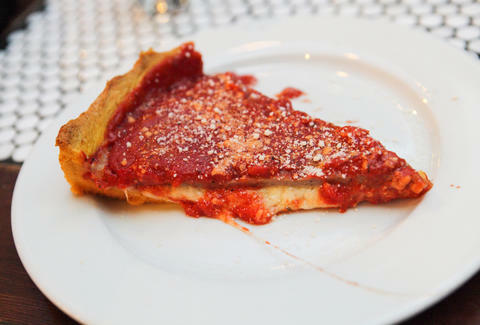 Gino's stands out among Chicago's deep dish purveyors for a cornmeal crust and a heavy (in a good way) hand with the sausage if you make it your topping of choice (you should). They've already begun their foray into Texas with locations in Houston and San Antonio, but a DFW location in Arlington is on the docket for 2015. 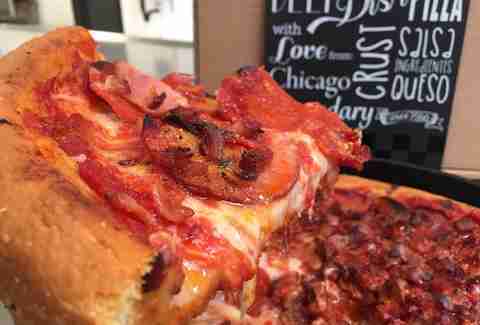 If you can't wait for Gino's (or just want to get your palate ready), Taste of Chicago in Addison does a respectable job with the deep dish, nailing the critical elements, like the over-the-top cheese payload and chunky tomato sauce. But when Gino's does arrive, definitely check it out -- word is, they're going to be incorporating a little Texas flavor (read: BBQ) into pizzas, which sounds like the start of a beautiful relationship.